My Ukulele Record Book is packed full on fun ways to let how to play the ukulele. Opening a school ukulele orchestra couldn?t be easier; Tim Lewis explains the basics in this book to help motivate young children learn an affordable musical instrument. My Ukulele Record book is suitable for young children aged between 7 and 11 and contains great activities and fun-to-play tunes created to inspire children and get them singing whilst playing. Teaching children how to play the ukulele is one way to supply the Wider Opportunities scheme and My Ukulele Record Book also contains National Curriculum references for Key Stage 2. 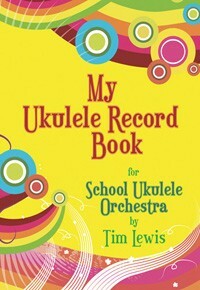 My Ukulele Record Book by Tim Lewis was published by Kevin Mayhew in January 1900 and is our 24677th best seller. The ISBN for My Ukulele Record Book is 9781844179114. Be the first to review My Ukulele Record Book! Got a question? No problem! Just click here to ask us about My Ukulele Record Book.